Eighth-ranked Stanford men’s soccer (9-2, 3-0 Pac-12) utilized passing prowess and a balanced offensive attack to overpower one of the best goalies in the league Sunday afternoon, as it defeated 24th-ranked Cal (7-3, 2-1) by a 3-0 margin on the road. The win, coupled with Washington’s home loss to UCLA, moved the Cardinal to the top spot in the Pac-12 standings and continued Stanford’s string of recent dominance over rival Cal, pushing the Cardinal’s record to 7-0-1 in their last eight games against the Golden Bears. The squad got off to a fast start in the hostile environment, scoring in the fourth minute after applying constant pressure in front of the Cal net. The early goal gave Stanford a lead that it would never relinquish. 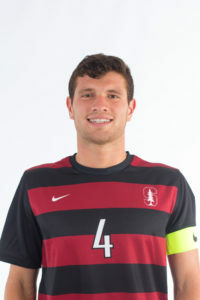 The first goal came off a double assist, furthering Stanford’s passing proficiency this season. The Cardinal entered the game ranked third in the country with 2.80 assists per game and added four more to their impressive total. Cal goalkeeper Drake Callender came into the game leading the Pac-12 in saves and save percentage, but the Cardinal offense proved to be too much. Callender made five saves on eight shots faced. Senior forward Corey Baird scored the opening goal off assists from fellow seniors Bryce Marion (midfielder) and Foster Langsdorf (forward). Marion dribbled past two defenders on the right side and directed a perfect cross to Langsdorf, who guided the ball to his diving teammate. Baird beat Callender with a header to the lower left corner, his third goal of the season and 13th of his career. Another header goal in the 14th minute continued Stanford’s fast start, this time from senior defender Tomas Hilliard-Arce. The second score also came off a superb pass, a corner kick from sophomore midfielder Jared Gilbey that found the head of Hilliard-Arce amidst a crowd of Cal defenders. The reigning Pac-12 Defensive Player of the Year once again contributed on offense with his second goal of the season. Meanwhile, Stanford redshirt senior goalkeeper Nico Corti spearheaded a solid defensive effort that limited the Bears to five shots on goal. Corti stopped all five, including a critical save in the 43rd minute, when a poor Stanford pass on the backend gave Cal junior forward Spencer Held a great scoring opportunity just outside the box. Corti sprinted out of goal and smothered the shot immediately to stop the Cal attack. The Cardinal goalkeeper now leads the Pac-12 in save percentage and shutouts, while his team leads the conference in goals against average. Stanford has shut out its first three Pac-12 opponents for the second straight year. The squad put the game out of reach in the 66th minute when freshman forward Charlie Weehan collected a rebound and sent it to junior midfielder Amir Bashti in the middle of the box, who scored with his left foot while falling. The goal was Bashti’s third in the last three games. Seven different Stanford players registered a point during the game, with three players scoring goals and four more picking up assists. “We got our our set-piece goal; we got our open play, lovely passing goal with a cross; we had lots of other good chances from good-flowing soccer. We’re certainly threatening in all different ways, which is exciting,” Gunn said about his team’s balanced offensive performance. The Cardinal may occupy the top spot in the Pac-12 standings for now, but second-place Washington has a chance to dethrone the two-time defending champs on Thursday at 6 p.m. Stanford gets to play in front of the home crowd for the first time in nearly a month. The game will be televised by Pac-12 Networks.